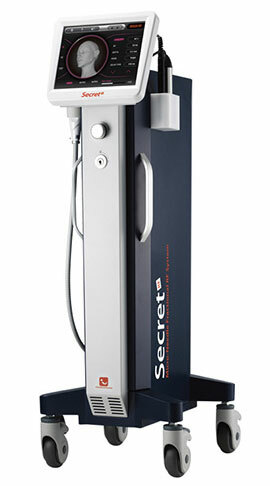 Secret Micro-Needle Fractional Radio Frequency (RF) System is at the cutting edge of anti-ageing RF technology today. It is perfect for skin tightening, lifting and rejuvenation. This system is safe for all skin types and has very low risk of PIH (Post-Inflammatory Hyper pigmentation) and burns compared to other optical based treatments like IPL/Laser. 1. Micro-needle cartridge will be attached to the skin. 2. The micro-needles will smoothly penetrate the skin with minimal pain. 3. The bipolar RF energy denatures the tissue around the micro-needles. 4. New elastic production and collagen regeneration process will then begin. 1. Burns – which is only a possibility and very mild. 2. Downtime – very minimal. 3. Post Inflammatory Hyper-pigmentation – low risk and minimal. Q. 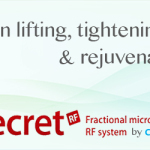 Is the Secret Micro-Needle Fractional RF treatment painful? A. This procedure is generally painless with the use of topical anaesthesia and proper application. Q. How long does a single treatment last? A. It requires 20 to 30 minutes for the anaesthetic cream to take effect followed by a 20 to 30 minutes of treatment which includes the after care. Allow for a total of one hour for the full procedure. A. It would take about three to four hours as you may feel a transient erythema (redness/rash) initially after the treatment. Q. How many sessions does this procedure require? A. It depends from person to person. But for some, it may take 4 to 5 treatments to see excellent results. Q. What is the time interval for every treatment? A. Usually once every 3 weeks. Q. What are the precautions after the treatment? A. You will need to wait for the erythema to be resolved before cleansing. When cleansing, it is suggested that you pat your skin with cool water using a towel. Avoid hot water. Refrain from sun exposure and use sun protection cream regularly after treatment. Hi Donna, you should really see a practitioner who does the treatments to get an indication of how many treatments you will need – it varies from patient to patient, however it is suggested that although you will notice results after one treatment you will need between 2 – 4 treatments to get the best results. I hope this helps.